STO | Société de transport de l'Outaouais > Sustainable Development > Green Commitment > My Good Habits. My Bus. 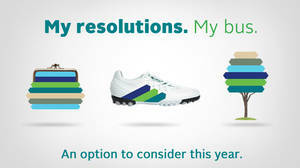 The arrival of the new year rimes with good resolutions. Here is an important one to consider: Public transit, which brings it's lot of advantages. The Agence de la santé et des services sociaux de l'Outaouais recommends 30 minutes of physical activity a day for better health. Walking has plenty of beneficial health effects. Besides increasing cardiovascular health and burning calories, it has a positive impact on mental well-being. Add walking to your modes of transportation for a good way to be more active. Walking to the bus stop instead of driving, or getting off the bus a stop early, can help you reach the Canadian physical activity guidelines. By getting rid of your car or combining driving with another means of transportation, you can give your pocketbook a break. The costs related to using a vehicle and parking downtown can be significant. Whether you buy new or used, there's more to the cost of your vehicle than the purchase price. CAA's driving costs calculator helps you build a better understanding of all the ongoing costs of owning a vehicle. Visit CAA's Web site. By taking the bus, you can save enough to take a holiday in the sun, do some renovations to your house, or go on more outings with your family. Check the Fares section to find out which fare best suits your needs. My impact on the environment. My bus. Taking the bus allows you to reduce your ecological footprint. One bus means 50 fewer vehicles on the road, resulting in a significant reduction in greenhouse gas emissions. Visit the Web site of our partner, Équiterre to learn more about the impact of your travel choices (parts of the site are in French only). See the section A Partner in Sustainable Mobility to learn about the positive environmental impact of public transit in the region. Improve your quality of life and that of those around you. Plan your bus trips now using the trip planner! Create a profile to receive the SUBITO PRESTO newsletter!